Does dappergamer belong in this group? Does phyrecyde belong in this group? Does agentj86 belong in this group? traversed the 9 halls of death shadow runner. student of the iga clan. Does hallowjack belong in this group? shadows in the dark I'm Korr. I'm a pretty alright guy that can handle (and survive) just about anything. I have my own place, a healthy relationship with my mom, my own car, and a job. I stay fairly busy. I slice, dice, and even puree! So.. 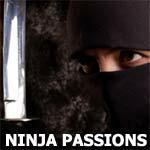 I'm not going to say I'm not a ninja, but I do know that admitting I am (if I was) would mean certain death because it breaks the code. Just ask. Does korrltd belong in this group?